Recent outbreaks in the US of the neurological form of equine herpesvirus-1 have improved horse owners’ understanding of the importance of biosecurity, an expert in equine infectious diseases says. Dr Roberta Dwyer, a professor at the Maxwell H. Gluck Equine Research Center in Kentucky, says preventing infectious diseases has often been perceived by horse owners as “which vaccines do I need this year?”. “While vaccines are an important part of an annual health care program, controlling and preventing diseases through management and disinfection has only come to the forefront in the past 20 years,” Dwyer writes in the latest issue of Equine Disease Quarterly. “Veterinary and university hospitals, because they house sick animals along with healthy ones awaiting routine surgeries, have been at the fore­front of what is now routinely known as biosecurity. Large hospitals now often have an individual solely dedicated to infectious disease control. 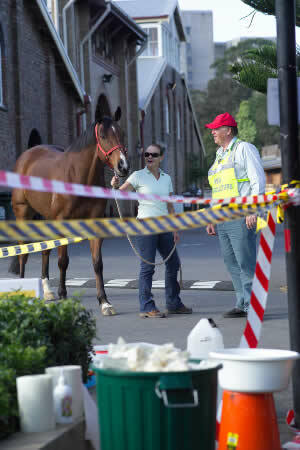 “The recent recognition of an equine herpesvirus variant causing neurologic disease and several large outbreaks spanning multiple states has horse owners really understanding the critical importance of biosecurity. Dwyer said that as the US approached the spring and summer, with hours of riding and horse enjoyment, people needed to be cognizant about not sharing equipment with others without disinfecting afterward; of washing their hands after handling other horses; of avoiding nose-to-nose contact of their horses with others; and quarantining horses when they return to the farm. Such measures did make a difference, she said. “As always, consult a veterinarian about an appropriate vaccination program and biosecurity recommendations for your particular circumstances. “Managers of equine event facilities also have a part to play. Financially, they want events to proceed without major disease interruptions and potential quarantines for the sake of the horses, the owners and basic economics. “However, how many stalls at busy facilities are completely cleaned and disinfected before the next round of horses arrives? Excellent information – what do you suggest we clean stalls with when we arrive at a horse show?